CLIMATE CHANGE AND environmental issues are high on the agenda for students at the 55th BT Young Scientist & Technology Exhibition, as almost 100 qualified projects are set to tackle the issues at the event in January. Between 9 and 12 January, 1,137 students will exhibit 550 projects across four categories - Biological & Ecological Sciences; Chemical, Physical & Mathematical Sciences; Social & Behavioural Sciences; and Technology. The projects very much reflect issues of ongoing global concern, with almost 100 qualified projects tackling climate change and environmental issues, doubling last year’s projects. Other projects will tackle issues from cervical cancer screening, the alternatives to and benefits of antibiotics, and the growing impact of social media. For the 11th year running, there will be more girls than boys competing. There is also a 62% increase in the number of qualifying for Chemical, Physical and Mathematical Sciences on 2018. Overall, a total of 237 schools from across Ireland are sending students to the exhibition in January. “The excitement is really building now in schools across the country as the students put the final preparations to their projects. And similarly back in BT we are beginning the mammoth task of building the exhibition and finalising all of the logistics that go with organising an event of this scale,” Managing director of BT Ireland Shay Walsh said. “Each year, we endeavour to make this exhibition better than ever before and I can guarantee that 2019 is no exception. The projects themselves are the main act, and once again, the creativity and talent for these young people will amaze visitors,” he said. 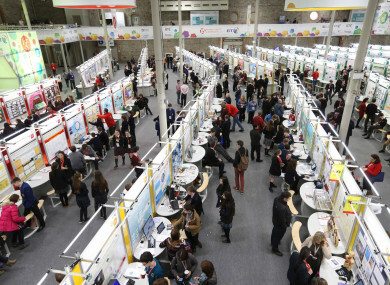 The BT Young Scientist & Technology Exhibition 2019 will take place from 9 to 12 January at the RDS in Dublin. There will be over 140 prizes on offer for individuals, groups and teachers. In addition, the overall winner will represent Ireland on the global stage at the European Union Contest for Young Scientists in Bulgaria next September. For more information about the exhibition or to purchase tickets, click here. Email “Climate change and social media - Here's what's in store for the BT Young Scientist Exhibition”. Feedback on “Climate change and social media - Here's what's in store for the BT Young Scientist Exhibition”.